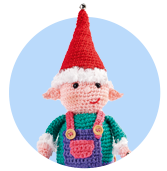 Craft For Charity And Make A Difference | Top Crochet Patterns – a charity that knits and crochets breast prostheses for women that have undergone a mastectomy or lumpectomy. The knockers are 100% cotton and are light and comfortable to wear. They match your bra size and they can even craft you some that are suitable for swimming too! Their team of makers around the UK give their time voluntarily to create each knocker, which is then supplied to the recipient at no charge. Their ethos is ‘made with love and filled with hope’ – what could be better? One of the most popular patterns I have designed for charity was for Save the Children. It was festive bunting, which was used to promote their Christmas Jumper Day campaign. You can now find the pattern on Ravelry, together with more of my patterns which are free and frequently used for charity. If you’re looking for projects, all of my books have a note in the front explaining that you’re welcome to use them for charity knits. If you ever find something you like but are not sure if you can use it, just contact the designer; often they will be happy for you to make the items to sell for charity. Whatever you create, you will be passing on the love and care you have cafted to someone else. Happy knitting! Knitted Knockers, Age UK, Save the Children – our columnist Sue Stratford tells us how she does her bit for these life-changing charities. I know a lot of crafters who love to knit for a good cause, and over the years I’ve been asked to design patterns for a variety of organisations. There’s nothing better than seeing something that you’ve put time and effort into going on to help someone else. 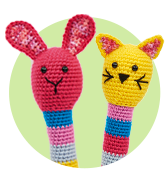 There are a lot of charities which take all sorts of knitted and crocheted items and – thanks to the internet – finding one that appeals to you isn’t too difficult. When I was at Wonderwool Wales, my stand was opposite an amazing lady who runs Knitted Knockers – a charity that knits and crochets breast prostheses for women that have undergone a mastectomy or lumpectomy. The knockers are 100% cotton and are light and comfortable to wear. They match your bra size and they can even craft you some that are suitable for swimming too! Their team of makers around the UK give their time voluntarily to create each knocker, which is then supplied to the recipient at no charge. Their ethos is ‘made with love and filled with hope’ – what could be better? One of the most popular patterns I have designed for charity was for Save the Children. It was festive bunting, which was used to promote their Christmas Jumper Day campaign. You can now find the pattern on Ravelry, together with more of my patterns which are free and frequently used for charity. If you’re looking for projects, all of my books have a note in the front explaining that you’re welcome to use them for charity knits. If you ever find something you like but are not sure if you can use it, just contact the designer; often they will be happy for you to make the items to sell for charity. Whatever you create, you will be passing on the love and care you have cafted to someone else. Happy knitting!